1) to ensure the total confidentiality of information, materials, documents and data of any kind relating to clients of Morgan & Mallet International which may be available to the candidate or may have been received by him/her during a possible job interview (a personal meeting, an interview by phone or the Internet interview via “Skype”). 2) not to use a photographic camera, videocamera, mobile phone, smartphone or sound recording during a possible interview with clients, in relation to clients themselves or their property, both inside and outside their property. 3) not to post photos, videos, records or post comments on social networks relating to the clients of Morgan & Mallet International Ltd (on the Internet, on Facebook, Twitter, Instagram, Google plus, blogs and all existing social networks). 4) not to disclose information, including address, telephone number, family composition, composition of the premises of the place of residence/sojourn and any other details regarding clients, not to sell such information to third persons or companies, recruitment agencies. 5) not to come to the office and not to communicate (before or after the job interview) directly with clients of Morgan & Mallet International for hiring, commercial or personal purposes. 6) not to accept a job offer directly proposed by a client of Morgan & Mallet International Ltd. or a representative of the client without notifying Morgan & Mallet International Ltd.
7) to observe strictly the abovementioned obligation relating to the confidentiality. 8) the candidate accepts that he/she will not hold the agency Morgan & Mallet International Ltd responsible for his/her remuneration or non-payment of salary, his/her employment contract, and his/her working conditions, conditions of employment accommodation offered by the client, and acknowledges that the Client/Employer will be fully responsible for his/her remuneration and working conditions. Morgan & Mallet International Ltd is only an intermediary that introduces candidates to employers, it does not act as an interim representative. 9) By entrusting the contacts and references of your past and present employers (phone, email address, postal address, letter of recommendation) you authorise Morgan & Mallet International Ltd to store your information in its secure database. 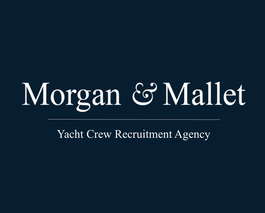 You give consent to contact your current and former employers for the purpose of verifying your professional experience and also for the purpose of commercial approach in the course of provision of the recruitment service Morgan & Mallet International by our consultants (campaign by e-mail, phone calls, regular mail). 10) Candidates applying online on www.yachtcrew.agency accept to receive our newsletter by e-mail every week. Candidates may request to be removed from the e-mail list of our newsletter by a simple e-mail to the following address: contact@yachtcrew.agency. You acknowledge that you have been informed that in the event of non-compliance with the above provisions, you will bear responsibility in respect of all clients and the firm Morgan & Mallet International who may legitimately raise a claim for compensation of the incurred damage, this list being informative and not exhaustive, besides the damages which may be claimed. Regarding the application form, you confirm the accuracy and veracity of the information contained in it. Any false information concerning the form and the documents submitted to Morgan & Mallet International (CV, letter of reference, certificate of employment, ID, diplomas ...) can be used against you during your employment or during your dismissal. By entrusting the references of your former employers, you authorise Morgan & Mallet International to contact them by phone, e-mail or by regular mail. By ticking the box and filling in the form, you confirm that you accept these conditions and accept your personal responsibility for any breach of the rules mentioned above.